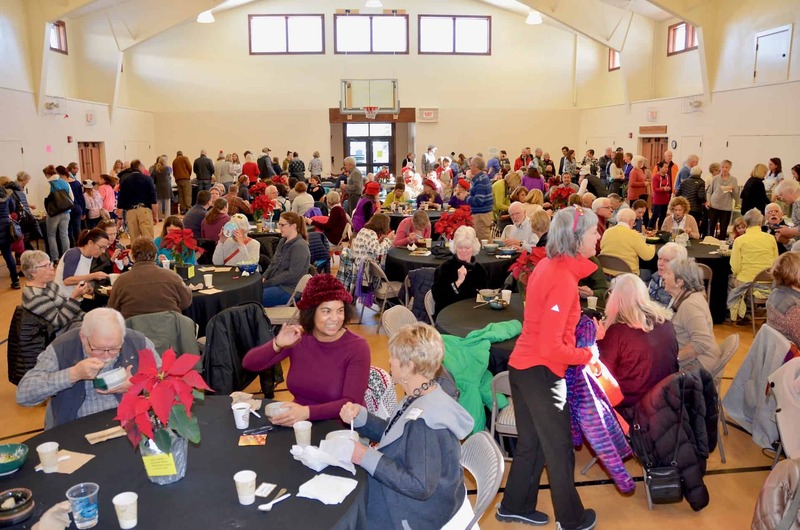 Join us for the 9th Annual Empty Bowls Event on Sunday, January 20th. 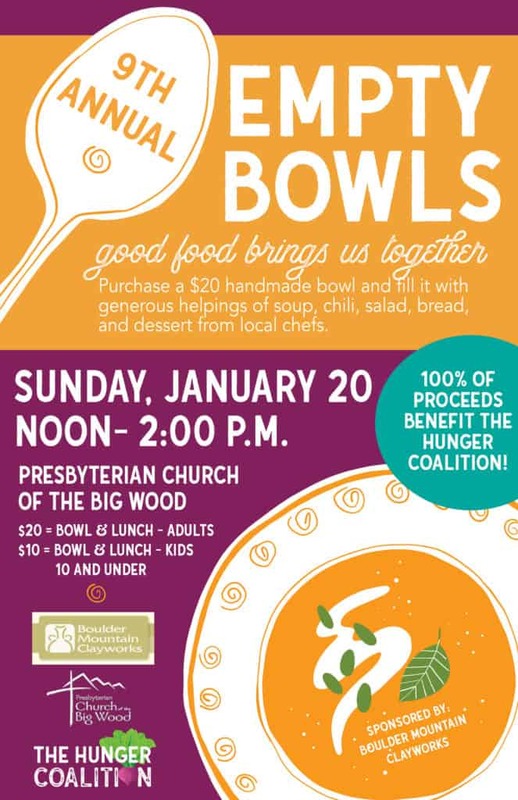 Boulder Mountain Clayworks, The Hunger Coalition, and the Presbyterian Church of the Big Wood are hosting the 9th Annual Empty Bowls event on Sunday, January 20 from 12 noon – 2 pm at the Presbyterian Church of the Big Wood. During this beloved community event, guests purchase locally made ceramic bowls for $20 per bowl (or $10 for children 10 and under), then fill the bowl with scratch-made soups, salads, chili, bread, and dessert donated by local chefs and caterers. Thanks to Boulder Mountain Clayworks, there will be more than 300 hand-crafted and hand-painted bowls from local artisans to select from this year. Boulder Mountain Clayworks’ staff and volunteers work hard making bowls, recruiting volunteers and restaurants, and ensuring the event is fun for everyone. Church of the Big Wood provides the venue. And local restaurants and chefs offer their culinary delights to fill the bowls with a satisfying meal. The bonus – the bowl is yours to keep! Empty Bowls is held at the Presbyterian Church of the Big Wood’s cafeteria from 12-2pm and features dishes from local restaurants and caterers including: Atkinsons’, Big Belly Deli, Bigwood Bread, The Chocolate Moose, CK’s Real Food, Esta, Cookbook Restaurant, Hangar Bread, Mahoney’s Bar & Grill, Nourish Me, Rasberry’s, Sun Valley Company, Warfield, and many more. Everyone in the community is encouraged to bring family and friends to Empty Bowls and enjoy a truly memorable and meaningful meal. Together, we can ensure that everyone in the community has enough healthy food to eat throughout the year. The Presbyterian Church of the Big Wood is located at 100 Saddle Road, across from the YMCA in Ketchum. All are welcome. Admission price is the purchase of a $20 bowl (or $10 for kids 10 and under). For more information, contact The Hunger Coalition at (208) 788-0121. The Hunger Coalition builds a healthy community through access to good food and addresses the root causes of food insecurity in collaboration with key partners.  For more information, visit www.thehungercoalition.org.